In this blog we have mentioned our methodology Digital Insight Management (DIM) many times, but what exactly does DIM consist of and why is it so important to implement it? This blog post will answer these two questions. What is Digital Insight Management? DIM is a methodology with the principal objective of making the best use of existing investment in Digital Analytics and Optimization within the organization. Companies invest in Digital Analytics and Optimization to improve their business but many of these fail to complete the cycle that must be followed to receive the greatest benefits from this work. Without actions there are no changes and without changes there can be no improvement, therefore companies that wish to IMPROVE must ACT. 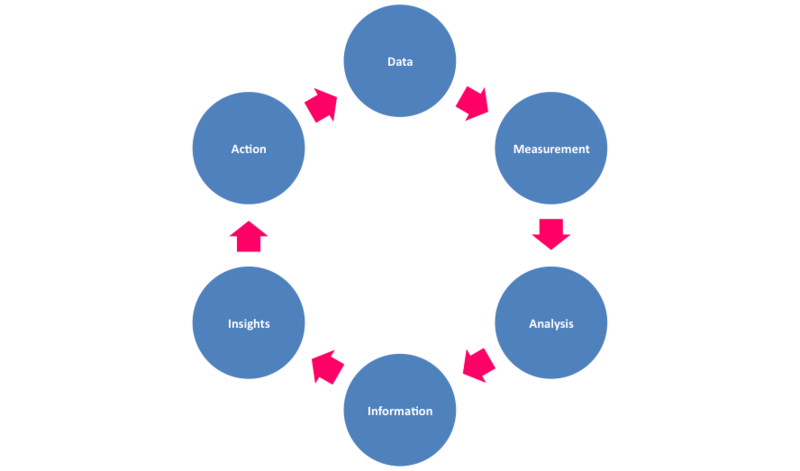 The process of data in action that is shown below is the process that companies must follow to be able to act and achieve the performance improvements that they pursue. However, the reality is that few companies arrive at the last step of this process, in fact most stay at the measurement or analysis stage. It is clear that companies that arrive at the analysis stage have some information that will allow them to make decisions, but to make good decisions, it is necessary to act based on relevant insights to avoid making decisions based on raw data extracted in the first step of the process. Therefore acting with solid knowledge is the reason that we must follow this process in order and not skip any steps. What is the purpose of the DIM methodology? Poor communication, which results in inadequately sharing information. Lack of organization, which implies that often it is not clear who is responsible for doing a specific task or creating a specific report, nor is it clear who should receive this report and act based on the information provided. Loss of time in manually creating reports that could be automated. Failure to translate data into information by not having a global vision during analysis. Improve internal communication and collaboration. Facilitate access to, consumption of and sharing of information within the corporate environment, and definition of the form in which the information, analysis of the results or suggestion of actions for online channels is presented to each professional based on their role. Reduce the efforts and resources necessary (both time and personnel) to collect and present all of the information that the organization needs to make business decisions. Compile data from different information sources (web analytics, social media, CRM, intranet, etc.) within one dashboard that gives the company a 360º view of the situation. Encourage the multidirectional exchange of data in the most efficient form possible to guarantee the minimum possible delay in distributing information and making business improvements. Are you already using DIM or a similar methodology? Mediasq Marketing Executive, responsible for content creation for the LATAM and Spanish Sweetspot blog. Inés is interested in everything related to Marketing and the online channel.